Your first fertility clinic visit can be overwhelming. You’re bound to have many questions that you inevitably forget when you’re face-to-face with your doctor. Review this list, and maybe bring it along to the visit, to make sure you have all of the information you need to move forward! 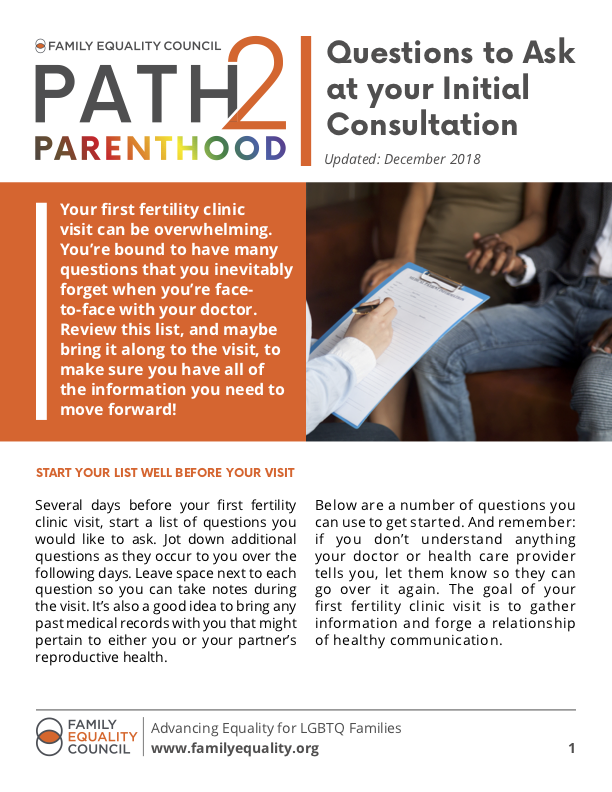 Several days before your first fertility clinic visit, start a list of questions you would like to ask. Jot down additional questions as they occur to you over the following days. Leave space next to each question so you can take notes during the visit. It’s also a good idea to bring any past medical records with you that might pertain to either you or your partner’s reproductive health. Below are a number of questions you can use to get started. And remember: if you don’t understand anything your doctor or health care provider tells you, let them know so they can go over it again. The goal of your first fertility clinic visit is to gather information and forge a relationship of healthy communication. What testing will my partner and I have to go through prior to fertility treatment? How long will it take to diagnose our infertility issue? How long will it take from when we are diagnosed to when we can begin treatment? Is there any sort of waiting list for treatment? How long should I expect to undergo treatment? Do you participate in clinical trials? If I am eligible, will I be able to participate? Are you comfortable with my doing my own research and possibly suggesting a particular course of treatment? What are your live birth success rates? What surgical procedures might you recommend for my partner and/or me? IUI do you recommend before moving to IVF? How does your office handle weekend inseminations? Are they done here or at another site? Do you do the weekend inseminations? How many IVF attempts will you make? What is your IVF success rate per embryo transfer? How many embryos do you generally transfer? Do you suggest I consider elective single embryo transfer? How will you help me to not conceive high order multiples? When undergoing IVF, will you perform all egg retrievals and embryo transfers? If either of these are not always performed by you, who will perform them? When undergoing IVF, will egg retrieval be performed at your office or through the outpatient clinic at a hospital? How will you monitor my treatment and how often? Will you always perform treatment monitoring or is it possible that on occasion another physician or a nurse might monitor? How is your practice affiliated with the embryology lab? Are the lab procedures done here or off site? What are the credentials of your laboratory and your laboratory director? What do you think about complementary medicine such as massage, acupuncture, and relaxation? What are your office hours and are you available after hours and on weekends? How will I communicate with you? Do you return phone calls the same day? Do you call back personally if I request? What role does the nursing staff play? Do they return calls or do you? If necessary, do you have access to donor egg, embryo and sperm programs? How do you handle insurance pre-approvals? If my insurance doesn’t cover testing and treatment, can we make arrangements for a payment plan or credit card payment? Knowledge is power! At your first fertility clinic visit and all subsequent visits: ask, ask, ask! It’s your body and your dream to become a parent. Being an active participant in your treatment will give you the best possible chance to realize your dream of having a baby.